The initial idea for Blade was born out of the want to have more 'human input' into the sound. The classic synthesizer parts for modulation are LFOs and Envelopes. The ‘human input’ is the keyboard we play and controllers like pitch bend or modulation wheel. A XY pad is perfect for the human input, but it controls only the filter and volume... We found this to be too limited. We wanted also to control the ‘harmonics’ of the oscillator...changing the waveform using the XY pad. At the heart of BLADE, lies the Harmolator. This special oscillator system uses 9 global controls which change the harmonic content (partials) of the waveform. The Harmolator allows oscillator spreading, fattening the sound and also square / sine wave sub-oscillator. 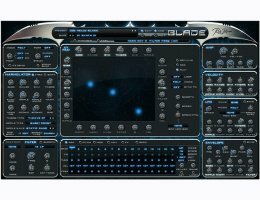 What's more, the sound can be modified further by the 21 per-voice distortions types and 14 filter types.Blade offers total control of the sound over time using an array of different modulation controls. The most significant of Blade is the central XY screen. Here you can either alter things directly by moving the cursor around, or you can record paths which can be replayed.The recorded path can be looped, bi-directional looped and tempo based as well. Even the speed of the XY recording can be modulated for dynamic changes! So the XY pad is also an incredibly advanced "human input" modulation source. Furthermore, Blade has the full range of other modulation sources, including a dedicated envelope, LFO and velocity as modulation source for Harmolator controls. Two FX units featuring all the FX from other Rob Papen products, plus the Arp / Sequencer and an Easy page which allows you to easily control sounds, all add up to an amazingly flexible and useful instrument at the cutting edge of today's synthesizers!